Registration is now open for the 2019 Jingle Bell Open. Click Here to register to golf, sponsor a hole or make a donation to the raffle. ​West Bend Christmas Parade possible. Hole Sponsorship's and other special sponsorship's are available. Thanks for attending the 2018 West Bend Christmas Parade. For those who were in the Christmas Parade, that you so much for making it such a great success! For those of you who attended the Christmas Parade, we hope you enjoyed it as much as we enjoyed putting it together! To see the pictures from the 2018 Christmas Parade, click here. Thanks to everyone who supported and played in the Jingle Bell Open. We are looking forward to a great parade and another great Jingle Bell Open in 2019. The theme for the 2019 Christmas Parade is will be announced here in the spring of 2019. If you have ideas, please send them to the parade committee here. ​Competition Guidelines have been updated and are effective 10/1/2017. Please time to read them prior to registering for the parade. Last week’s photo was from May 2, 2002, and was named “Christmas Parade.” I expressed surprise that a photo taken in May had something to do with Christmas, but it turns out that it really does take that long to plan a Christmas parade. We got our first clue when eagle-eyed Daily News ad sales maven Mary Jones pointed out that one of the heads in the back row of the photo appears to be Daily News publisher Heather Rogge — specifically, the head second from the right in the back row. Julie Sears, Steve Ciccantelli, Mary Gamerdinger, Mary Husar Martin, Theresa Fuerbring, Heather Rogge and Carole Klotz. So what are they doing here, posing for a Christmas event on what is probably a fairly warm day, one of them wearing a full Santa suit that is presumably dripping with more sweat than John Goodman’s bike shorts? 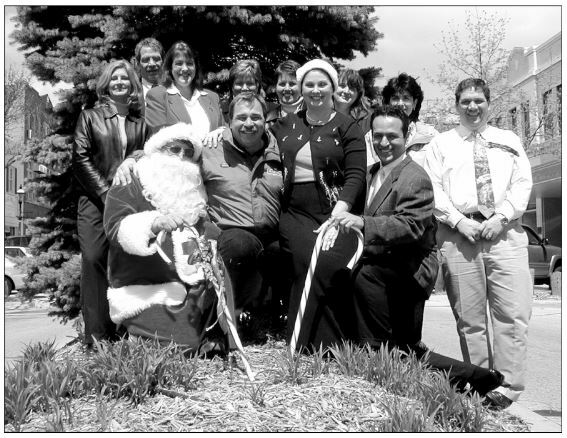 So here’s what happened: In February 2002, the West Bend Area Chamber of Commerce announced it was looking for someone to take over the annual Christmas parade. The Chamber had run the parade for 13 years, and at present it has been a tradition for more than 80 (if my math is correct, and there’s a good chance it isn’t). So a parade committee was formed to start running the event. It was made up of local business leaders, and was cochaired by Josephine Minskey of Lakeshore Newspapers (the company that includes the Daily News and Washington County Post) and Mary Gamerdinger of the Downtown West Bend Association. — this year’s event is Aug. 7 at West Bend Lakes Golf Course. This year’s parade is scheduled for Nov. 26. So there you have it — and apparently, even though this photo depicts an uncommon circumstance, it is not strange for the planning of the parade to begin that early. Heck, it’s not even May yet and they already have information for the Jingle Bell Open and this year’s parade online. Don’t believe me? Go to www.westbendparade.org and get ready to eat crow, weirdly skeptical hypothetical reader. Click Here to see the pictures from the JBO. This is the fund-raiser that makes the Christmas Parade possible. The West Bend Christmas Parade is always looking for a few good elves. Volunteers can get involved for only the day of the parade or be more involved throughout the year with the parade and the Jingle Bell Open. Click Here to send a message for more information. CLICK HERE to see the 2018 Sponsors of the Jingle Bell Open which makes the Christmas Parade possible!